It's a healthy response to feel wary whenever you approach music from the children of major artists. Not automatically denigrate it because of its lineage - good music can spring from anywhere - but some skepticism can be expected. After all, I haven't exactly forgotten the 'legacies' that acts like Hot Chelle Rae and LMFAO have landed courtesy of their family connections, when in any sane world neither of those groups would been signed or gotten airplay in the first place. And I've got the same issues with nepotism that everyone does - more qualified, experienced, or just plain better artists getting turned away in favour of a famous son or daughter. That being said, I was actually anticipating the debut album from Krystal Keith more than I initially expected. 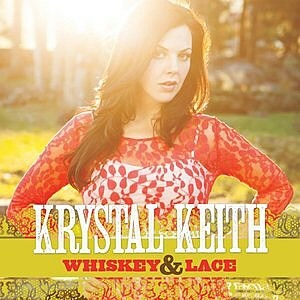 She's the second daughter of Toby Keith, a favourite country singer of mine and one who I reviewed earlier this year. It's interesting to note that Toby Keith hasn't exactly had a great 2013, especially when it comes the tumultuous year country music had as a whole, and while I did mostly like his album Drinks After Work, it hasn't really stuck with me. Indeed, Toby Keith seemed almost amused that critics took his album as well as they did (another sign that some elements of the country critical press are too soft on big name artists). But if there's one thing about Toby Keith I've respected, it's that he has a fairly good head for business, and if he was more focused on helping his daughter get started over his own solo record, it'd make some sense to why Drinks After Work felt a bit light-weight. And considering she's signed to his label Show Dog-Universal Music, he produced this album, and he contributed a few songs, it'd be wrong to ignore Toby Keith's watchful eye on his daughter Krystal's debut album Whiskey & Lace. But putting that aside, how did the record turn out? Eh, it's okay - in fact, by most reasonably standards, it's pretty good for a debut country album and will likely satisfy the majority of listeners. But I can't help but feel underwhelmed by Whiskey & Lace by Krystal Keith, and not from any one major issue, but a bunch of niggling elements that don't quite come together. But in comparison with other debut albums from female country singers, this album doesn't quite measure up. Let's start with Krystal Keith herself - she's got a rich, soulful alto that has a decent range and some genuine charisma. You can definitely tell it's her debut album, though, because she hasn't quite mastered the ability to convey a lot of emotion through her delivery, which left me a little cold on some tracks. It reminded me a lot of early Reba McEntire, before she truly had a handle on her persona and emotional delivery, but Reba managed to rise above that and I'm confident Krystal can as well. On that note, the album's instrumentation and production do remind me somewhat of the pop-country era of the 80s, in that there's a lot of flash and polish, but not a lot of texture, particularly in the rougher guitars. This is an issue that cropped up on Toby Keith's production on Drinks After Work, and it definitely surfaces again here - the plucky, generally pleasant nature of the acoustic instruments compliments the mix well, but some of the tonal choices on the electric guitars don't work as well. They sound a bit too clean, as if the distortion and texture were sanded off entirely, and even the points where there is a rougher edge (like on 'Down Into Muddy Water'), none of it has any organic swell or presence. It sounds very theatrical, as if country instrumentation was adapted for the stage without that organic authenticity. Granted, that's not always a problem with pop-inspired country - but with Krystal Keith not really impressing me vocally and the melody lines as inoffensive and uninteresting as they are here, it starts to become a problem. And things don't really get better when we move into songwriting and lyrics. I'll say this: Krystal Keith's songwriting has a lot less of the clumsiness that her father's been struggling with as of late, and her songs are easily the best of the album. 'Daddy Dance With Me' is probably the highlight for me, because it's a plea for her father to see her as a woman and accept her moving on with her life - and unlike most of this album, it feels like it springs from a real, emotional place. I just wish the rest of the album had that same weight or ambition. Sadly, however, Whiskey & Lace is a decidedly 'safe' album, at least from a songwriting point-of-view, and the songs that do try don't work as well as they should, mostly courtesy of some sloppy songwriting (there's no excuse for some of the bad rhymes on this record). Take 'Can't Buy You Money', a song that tries to show the plight of a mother dealing with money troubles with lines like 'happiness can't buy you money' - but between the lyrics and Krystal's delivery, I don't buy that there's any happiness here. Or take 'What Did You Think I'd Do', a song where Krystal's so over the moon for a guy she jumps into marriage even though he's dead broke - and the song frames it with all of Krystal's exuberance and none of the dozen warning bells that should be going off! Or take 'Beautiful Weakness', a song that features Toby Keith and sounds raw and vulnerable as it talks about love and relationships - but the song is so maddeningly unspecific that I can't help but feel distant from the song. Even 'Whiskey & Lace', a song about a stripper struggling to get by as a single parent, would have more weight if Krystal wasn't just telling a story about someone else and framing it as tastefully as she possibly can - which really doesn't reflect reality! Look, in the end, this album isn't bad, but it's not as strong of a debut as it could have been, and it doesn't effectively establish Krystal Keith as a presence behind the microphone. All of the topics Krystal and her songwriters touch on were handled better this year by Kacey Musgraves and especially Brandy Clark, and she doesn't quite have the stage readiness that's behind a singer like Danielle Bradbery. That being said, it helps matters that Toby Keith as a producer and songwriter avoids the majority of the pop-country cliches this album could have fallen into, and thus the record has a very pleasant and inoffensive sound. But that might be even worse, because it doesn't really stick in the memory or stand out much against the crowd, which is disappointing. So for me, Whiskey & Lace is a 6/10 and a recommendation only if you're heard the new albums this year from the other female singer-songwriters I've reviewed this year. But I will say this: if Krystal wants to grab a hold of her career and start writing the majority of her songs on her own, all power to her - it might just be what she needs to break out of her father's shadow and make something truly special.